Carbohydrates, bread in particular, are easily one of my greatest vices. I’m totally a CARBOHOLIC! I’m typically one of those people at restaurants that fill themselves silly with complimentary bread that by the time my entrée arrives, I’m already full! And one American chain restaurant has the tastiest complimentary bread….Red Lobster’s Cheddar Cheese Biscuits ®. SOOOO GOOD! So when I came across their “top secret” recipe on ABC News’ website, I HAD to give them a try! By using Bisquick baking mix ®, it was SUPER easy and can be made in any home within a few minutes. After pulling these golden beauties from the oven, I quickly pulled one apart and popped it into my mouth. Was it good? Sure! Dense…crumbly….cheesey. 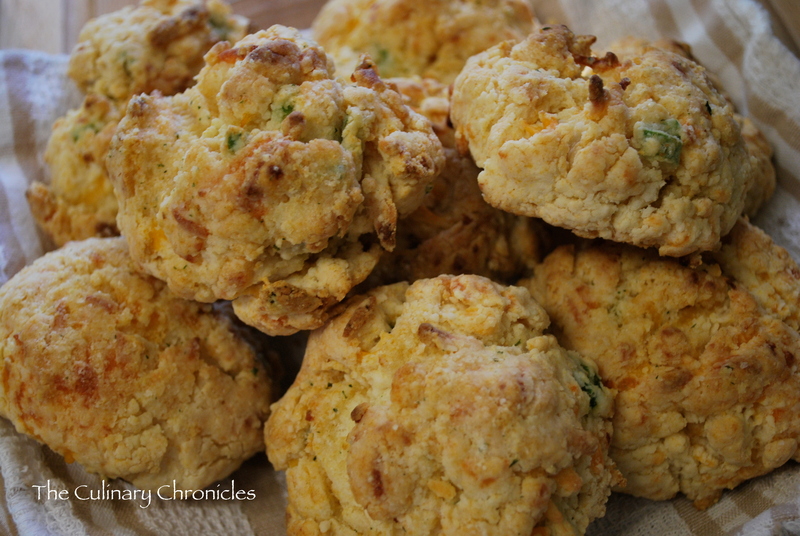 Did it taste like Red Lobster’s Cheddar Biscuits ®? Eh….not really. Yes, it was a nice biscuit but something was missing that I couldn’t put my finger on it. I did add chopped scallions to the batter for a nice onion flavor but I think if I try this again, I’ll substitute the regular whole milk for buttermilk. The extra creaminess and tang that buttermilk has may be the trick. Still—we enjoyed them, especially with our BBQ! And although they weren’t like Red Lobster’s ®, it was still tasty! Combine Bisquick with cold butter in a medium bowl using a pastry cutter or a large fork. You don’t want to mix too thoroughly. There should be small chunks of butter in there that are about the size of peas. Add cheddar cheese, milk, scallions and ¼ teaspoon garlic. Mix by hand until combined, but don’t over mix. Drop approximately ¼-cup portions of the dough onto an ungreased cookie sheet using an ice cream scoop. Bake for 15 to 17 minutes or until the tops of the biscuits begin to turn light brown. When you take the biscuits out of the oven, melt 2 tablespoons butter is a small bowl in your microwave. Stir in ½ teaspoon garlic powder and the dried parsley flakes. Use a brush to spread this garlic butter over the tops of all the biscuits. Use up all of the butter. Makes one dozen biscuits. Oh, I LOVE Red Lobster’s cheddar biscuits! Thanks for posting this, I’ve been wanting to make biscuits.